(RNS) — It didn’t take long for some preachers to start telling us why God caused the horrible mass murder in Las Vegas to happen. 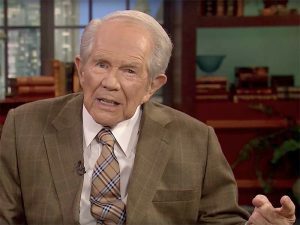 Pat Robertson led the way, declaring that it was divine retribution for the widespread “disrespect” for Donald Trump in America. The best response to such bad theology came from a bus driver I met several years ago in New Orleans. I was there with my wife for an academic convention and decided one afternoon to take a tour of the city. It was a year after Hurricane Katrina, and in his insightful running commentary, the driver offered some personal memories of what folks in New Orleans had experienced in that disaster. The driver told us that he grew up in the Seventh Ward — which holds the largest African-American Catholic parish in the country. He had received a Catholic education at a school run by nuns, and as we passed his home in the neighborhood, he commented that his mentors had done a fine job. We stopped at a blocklong grassy area. The driver then went on to make his theological point. In the wake of the disaster, he and his family had spent some time in Texas. “It was the Bible Belt,” he noted, “and I’ve got tell to you about something disgusting that I heard there.” A local preacher had gotten some publicity, he said, for proclaiming that the destruction caused by Katrina was a judgment from the Lord on New Orleans because of the city’s many sins. The driver knew when preachers moved into bad theological territory. There are many warnings in the Christian tradition about the dangers of claiming to know God’s specific purposes in human events. “I tell you, on the day of judgment you will have to give an account for every careless word you utter” (Matt. 12: 36).